Plug your ears into the music. Quad has drawn on its decades of expertise with Electrostatic Loudspeaker to design its Planar Film Diaphragm headphones. Once again Quad delivers "the closest approach to the original sound". Most headphones use mass-produced dynamic cone drivers, the limitations of which can hamper transient response and cause uneven frequency response. QUad's cutting-edge planar magnetic technology delivers a more natural and accurate sound, ensuring you hear every nuance of the recorded musical performance. The Quad ERA-1 incorporates an ultra-thin, electrically active diaphragm - thinner than a human hair yet extremely light, strong and highly elastic. This is fused with a precision arranged magnet array, designed to maximis sensitivity and consistency of the applied force over the driver area. Patented non linear vibration suppression technology allows the driver's effortlessly extended frequency response to be heard unsullied, ensuring perfect clarity. The metal cavity behnd the driver is specially designed for optimal acoustic performance, and the drivers themselves are closely matched to ensure spacious, three dimensional stereo imaging. 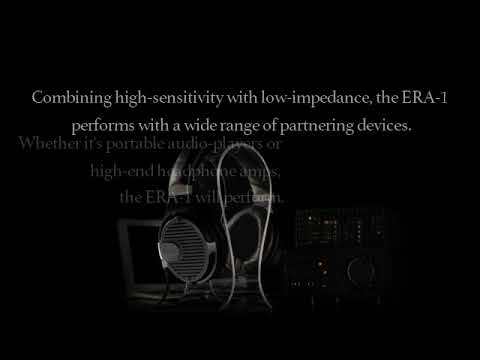 The result is that the ERA-1 provides a misucally engaging, dynamic and effortless sonic perfomance that suits all music types. Quad's planar magnetic driver hasmuch better phase coherency, since all parts of the diaphragm are vibrating in concert without break up and delayed response. The driver's flat conductor pattern, with absence of inductive components, eliminates inductance-related intermudulation distortion - this is especially common in dynamic drivers with high impedance and a high number of voice coil turns. Many planar magnetic headphones require high power amplifiers to driver them. The Quad ERA-1 combines high sensitivity with low impedance to enable excellent performance with a wide range of partenering devices, from portable audio players to high-end headphone amplifiers. Quad's valve based PA-One headphone amplifier/DAC makes a superb match for the ERA-1,combining sonic clarity and fluidity to stunning effect.